Our brain’s chief function is to keep us alive, whether it was thousands of years ago – in the forest, or today at the workplace. In order to keep us alive, our mind will foster the use of our best skills and talents towards nourishing those things that increase our chances of safety; like a feeling of belonging, security, and bonding. On the contrary, our brain will make us (mostly unconsciously) avoid people, places, or situations that it considers as threatening. These include a culture -or a leadership style that promotes fear, constant stress, and pressure. Professors Sonja Lyubomirsky, Laura King, y Ed Diener found in a meta-analysis of 225 research involving more than 275,000 people that there is a direct relationship between employees’ emotional wellbeing and business results. Recent research has also found that the most prominent business competitive advantage is developing the potential of your people. The best way to unleash the untapped potential of an organization is to train Positive Leaders that create a culture of emotional wellbeing at work. Does all this translate into bottom line results too? The answer is yes. Gallup institute proved that increasing employees’ satisfaction resulted in 32 Million dollars profit to a chain of stores through the connection between higher satisfied employees and more substantial sells. Companies that do not have a strategy to increase employees’ emotional wellbeing lose every year an average of 15 days per employee. The most effective leaders create cultures of Emotional wellbeing, and this drives 300% higher innovation, 31% higher productivity and 17% higher engagement. At the same time, they achieve to reduce 35% stress. Harvard, Standford and London Schools of Economics; together with leading firms like the Boston Consulting Group and Deloitte; talk about employees’ emotional well-being, positive leadership styles, and growing mindsets as today’s most significant competitive advantages. George Kohlrieser, a former FBI veteran hostage negotiator, is an expert on leadership. He uses neuroscience and the science of happiness to help people rewire their brain to become highly effective leaders. In this interview for WOBI, Kohlrieser explains how companies who want to improve their results need to put employees’ happiness as their first business objective, even before clients satisfaction. 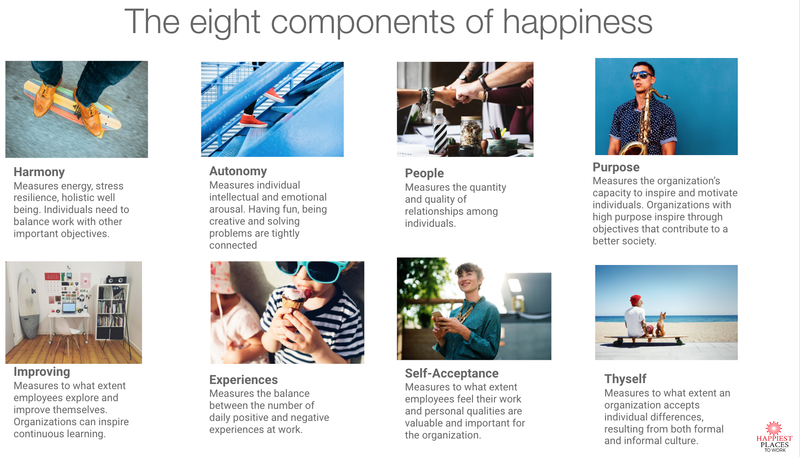 The first challenge of organizations who want to use the science of Positive Leadership, Emotional Wellbeing, and Happiness to strengthen their business, is to understand what is happiness at work and which are their ingredients. The most significant mistake many well-intentioned companies make is to think happiness at work looks like “playing and joy.” Real happiness at the workplace is not related to tennis tables, relaxation areas, and free food. Chief Happiness Officers need to know the ingredients of effective leadership, positive culture and meaningful happiness at work. Their role is to measure these ingredients and create the conditions for talent to flourish. French magazine “Society” criticized the misunderstanding of many organizations around what happiness at work really is. Organizational excellence has to do with a positive leadership culture. People need time and energy to devote to different areas that nourish their emotional and intellectual lives. High balance reflects in more energy and concentration to spend when at work; higher creativity, problem-solving and collaboration. Everyone needs to feel trust in his or her capacity to take decisions and show accountability. It might seem repetitive to remind us all of the importance of purpose, so I will not do so. Let me just pinpoint that although many organizations have a stated goal, few are those that have linked every job to it; so that people know exactly how they contribute to the higher Why. A Mission that motivates is one that allows each person to feel they contribute to a greater good. While companies cannot exist without making profits, this cannot be their purpose. Millenials’ most relevant criterium to choose a company is its purpose and its values. in a complex world with constant change, what differentiates the most highly effective teams, is their degree of trust and collaboration. It is not necessary that people like each other, but it is essential that they have a common goal, value their different skills, and that they trust and respect each other. A key to success is quick learning and adaptation. Successful organizations need to provide individual space for personal growth within a trusting, learning culture. Learning only happens if a Positive Culture allows failure to become the currency for learning; and consequently, if leaders are willing to show their vulnerability. Only then the necessary trust for people to be creative and try things out of the ordinary happens. Today’s successful organizations need highly creative teams. One of the things that differentiate the most Effective leaders is their capacity to delay -and inspire others – instant gratification to attain a higher purpose. Nevertheless, people need to experience often positive emotions that counteract the effect of negative ones. One of the most potent human motivations is recognition. Recognition can be internal or external. Positive Cultures allow people to be themselves and to speak up to their convictions and values. Thanks to work done by scientists and organizations, we now know how to measure these critical components to make leaders grow into effective positive leaders; using the science of emotional wellness. The first step to becoming a Positive Leader is to lead yourself well. If leaders cannot lead themselves, how can they possibly make anybody follow them? Feel Logic is the leading global provider of positive leadership coaching. Our mission is to help organizations achieve their strategic objectives by giving leaders and their teams tools that enhance their performance, creativity, and resilience. We provide a Positive Culture analysis and Positive Leadership Coaching with our proprietary methodology based on science. We assess each component of organizational excellence and positive leadership, detect paths for growth and help achieve excellence. We take special care to customize our coaching and consulting programs to the unique needs of our clients. Click here to take your personal Positive Leadership assessment (it’s free). Silvia Garcia is the founder of Feel 🙂 Logic and Happiest Places to Work. She is a highly sought motivational speaker, writer, coach, and consultant. Silvia Garcia, is a renowned expert on Happiness with the vision to transform lives through the science of happiness applied to the economy, workplace, politics, and education. For more than 10 years Silvia traveled the world to learn about happiness from the best researchers and masters, such as the founder of Positive Psychology, Martin Seligman; the Happiest Man on Earth, Matthieu Ricard, or the Prime Minister of Buthan, the first country to decide to measure Gross Domestic Happiness. Silvia brings the knowledge of all disciplines together: positive psychology, economy, sociology, anthropology, medicine, and neuroscience. This unique approach gives people and organizations an unknown depth of knowledge and tools to improve their happiness. She is the founder and CEO of Happiest Places to Work and Feel:)Logic, two organizations that help measure and grow happiness, and that certify organizations as "Happy Places to Work". Silvia also trains and certifies Chief Happiness Officers, and helps organizations use the latest science of happiness to create the conditions for employees and citizens to flourish, increase customer satisfaction, reduce absenteeism by half and double innovation and creativity. She is a World Authority in Happiness and is annually invited to discuss the annual report on happiness commissioned by the United Nations. As former Global Director of the Happiness Institute of Coca-Cola, Silvia helped Coca-Cola use the science of emotions in Marketing and Communication while sharing all knowledge with society. Campaigns based on the science of happiness became some of the most memorable. She also increased the level of energy, happiness and emotional well being of Coca-Cola employees. Silvia is a demanded keynote speaker on the learning and applications on the science of happiness.